There are many kinds of budworms including tobacco, petunia, rose, spruce and geranium. All are bad in that they’ll target the flowering buds and rapidly destroy the new growth. Budworms are the larval stage of a small moth which will live it’s life on flowering plants. The adult stage (moth) will be found lingering around plants they want to target. They are drawn to these plants because of pheromones left by previous activity so once a yard or plant gets activity, more activity will surely follow. 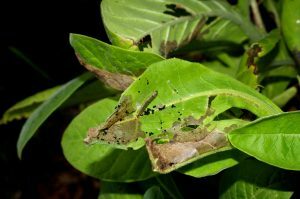 View of damaged leaves of tobacco plant covered with budworm droppings and a feeding larvae. Mating females will lay eggs on the targeted plant all summer and fall and depending on where you live, the eggs will either hatch late in the year or the following spring. This will also depend on when the plant blossoms. So for a rose budworms, the cycle will play out over and over during the course of one summer. From the eggs will crawl small caterpillars which feed upon the young bud of the host plant. This larvae stage can range in color from cream to tan to brown to green. Budworm larvae will feed for 1-2 months and once they get their fill, they’ll migrate down to the ground under the host plant where they’ll pupate and emerge as the adult moth. Adults mate, lay eggs and die in late fall and early winter. Budworm pupae will typically hatch after a month or two so most active infestations will have 2-3 generations per summer. Any pupae in the ground come the fall and winter will hibernate waiting for the new year and the new spring before they emerge. Larvae stages are small, around 1/4″, but can grow to 1/2″ or more before pupating. Because of their small size and ability to “match” the color of their host plant, budworms can be hard to find or see. Unfortunately their damage to is easy to notice as is their droppings. Budworms most like to feed on young flowering buds. They’ll ravish the flower as quick as it grows causing unsightly damage and though this damage usually isn’t enough to cause the plant to die, eventually the leaves and stems of the host plant will stop growing. If the plant stops producing new buds, the worms will move to the leaves of the host plant. Typical sign of damage will be brown spots, disappearing buds or leaves, black pellets (their feces) and the feeding worm. Fortunately budworms are easy to control with the right product. For non edible plants like jasmine, roses or geraniums, BIFEN XTS is highly active on all budworm species and one treatment will knock them out. Be sure to treat all parts of the plant as well as the ground underneath. This insures you’ll get the migrating budworms moving to the soil to pupate. Add 1/2 oz of Bifen per gallon of water and expect to get 500-1000 sq/ft of coverage per mixed gallon. Make your applications with any standard PUMP SPRAYER. For large yards where you expect to spraying 5 or more gallons of mixed material, use a HOSE END SPRAYER. 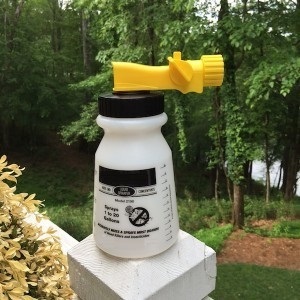 Using our sprayer, you’ll need to add 2 oz of Bifen to the sprayer and then fill it with water to the 5 gallon line. Use the entire tank over 2500-5000 sq/ft of plants. If the host plant will yield fruit or vegetables or if it’s a species you’ll harvest like the tobacco plant, use an organic gardening approved product like INSECTICIDAL SOAP. This concentrate can safely be applied to any plant that will yield fruits or vegetables yet it’s strong enough to take care of most any pest including budworms. Spray twice a month when budworms are active during the budding season for your plants. Add 2.5 oz of concentrate per gallon of water for every 500-1000 sq/ft. 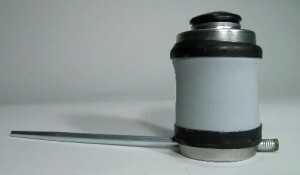 using a standard pump sprayer. When using our HOSE END SPRAYER (seen above), add the concentrate to the sprayer without water, hook it to your hose and spray. When you add enough concentrate to fill the sprayer to the 5 gallon line, you’ll need to spray that amount over 1500-3000 sq/ft of plants. If preferred, you can dust edible plants with BT GARDEN DUST. 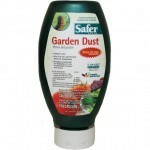 This dust is odorless and uses a tiny bacteria which will kill insects that ingest it. Focus your treatment on the part of the plant they’re targeting by using a HAND DUSTER or DUSTIN MIZER and apply the dust once a week. 2 oz of Dust is enough to cover 50 sq/ft of plants. Our CRUSADER hand duster will hold about 2 oz when filled half way and is ideally suited for making the application. For large jobs, our DUSTIN MISER will enable you to “crank” the dust out over large areas quickly. It will blow the dust a good 20-30 feet and can hold a full container of BT Dust in the dust hopper. For large gardens, spraying or dusting may not be the best way to get adequate coverage. Any garden area over 2500 will be easier to treat by fogging with the BIFEN IT or INSECTICIDAL SOAL discussed above. These machines essentially take the liquid mixture an convert it to a mist allowing you to cover all surfaces more efficiently by using less product and saving time. For small areas 2500 sq/ft or less, our MINI-FOGGER is well suited. It has a 32 oz holding tank so when using Bifen XTS, you’ll only need to add .25 oz of concentrate per tank of mixed product. Use the full tank to treat 2500-5000 sq/ft of plants. For large lots 1/4 to 1 acre, our FM6309 is better suited. It has a gallon sized holding tank so when using Bifen XTS, you’ll need to add 1 oz to the tank with 1 gallon of water. The gallon of mixture can then be used to fog over 10,000 to 20,000 sq/ft of plants. 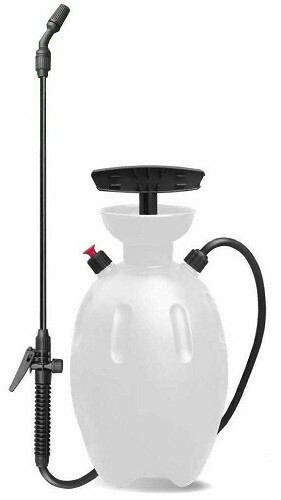 This fogger can pump out the treatment quickly; about 1 gallon per 12 minutes. Lastly, for farms or large lots 1/2 acre or more, a MIST BLOWER can prove most effective and efficient for making the application. This gas powered back pack type sprayer has a holding tank of 3.0 gallons and can cover 1 acre per tank. Add 3 oz of XTS concentrate to the tank, fill it with water and disperse the entire tank over 1/2 to 1 full acre. This mist blower will blow the fog over 40 feet out and since its gas powered, you won’t be hindered by attached power cords.